Ben Fort Smith was born 1796 in Kentucky. He and his father and older brother served in the Natchez expedition and in the Creek campaign. As a member of Andrew Jackson’s staff he fought at the battle of New Orleans and was promoted to major before he was nineteen. He took part in making treaties with the Chickasaw and Choctaw Indians in 1818 and 1820. On July 25, 1823, he was appointed United States agent to the Chickasaw Indians; he resigned on December 16, 1829, because of friction with the Colberts, chiefs of the Chickasaw nation. In the spring of 1832 he fought in the Black Hawk War. During the Texas revolution Smith commanded a company of volunteers in the early activities fought at Gonzales and relieved J. M. Collinsworthqv at Goliad; he was with Austin in the Siege of Béxar. In November 1835 he set out for Mississippi to recruit troops for the Revolutionary Army. His recruiting work and the settlement of his father’s estate delayed his return to Texas until February. He re-entered the army as a private on March 13, 1836, but the company he had recruited did not arrive until late in March. During the retreat from Gonzales he served as quartermaster and as acting adjutant to Sam Houston. Although enlisted in the company of William H. Patton, Smith was transferred before the battle of San Jacinto to the cavalry company of Henry W. Karnes. He served after May 6 as adjutant general under Thomas J. Rusk and remained in the army until August 5. After the signing of the treaty of May 14, 1836, Smith and Henry Teal served as commissioners to overtake Vicente Filisola’s retreating army and secured Filisola’s ratification of the treaties of Velasco at the Mexican camp west of Goliad on May 26. In the fall of 1839 he served on a six-week expedition up the Brazos River against the Indians. He died at the home of a brother, Shelby Smith, at White Sulphur Springs on July 10, 1841. John S. Roberts signer of the Texas Declaration of Independence, was born 1796 in Virginia. At age sixteen he enlisted in the Tennessee Militia for service in the War of 1812. He participated in the Battle of New Orleans as a member of Col. John Coffee’s regiment. 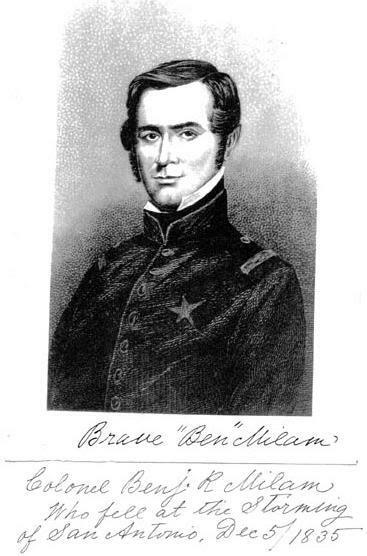 In 1822, he joined the Ayish Bayou forces that took part in the Fredonian Rebellion, led by Haden and Benjamin W. Edwards against the Mexican government of Texas. Roberts was a major in the Fredonian forces and served as a judge at the impeachment trial of Samuel Norris, alcalde of the Nacogdoches District, and José Antonio Sepúlveda, captain of the Nacogdoches Militia. Roberts enlisted in the Nacogdoches Independent Volunteers on October 4, 1835, as a first lieutenant and was later promoted to captain under Capt. Thomas J. Rusk and saw distinguished service in the Siege of Béxar. He died August 9, 1871. His body was interred in the old Oak Grove Cemetery in Nacogdoches.